For us here at Treasuredays, 2017 is going to be a year of exploration and seeking out new treasure hunt locations. The first area we have been visiting is middle England - Oxfordshire, Warwickshire, Worcestershire and Gloucestershire, where some of the most stunning locations can be found in the Cotswold hills. 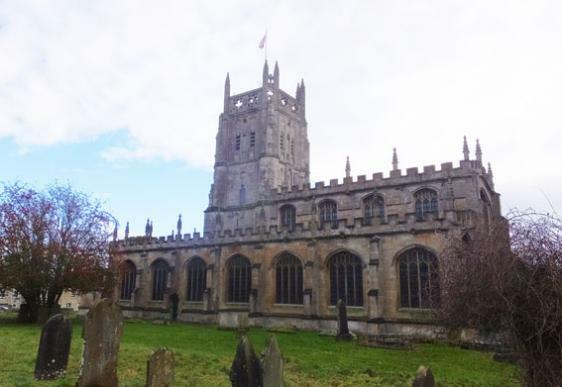 Our first ‘find’ was the small town of Fairford in Gloucestershire –and its glorious 15th century church of Saint Mary. Fairford lies about 17 miles south of the start of our existing Cotswolds treasure hunt in Bourton-on-the-Water. 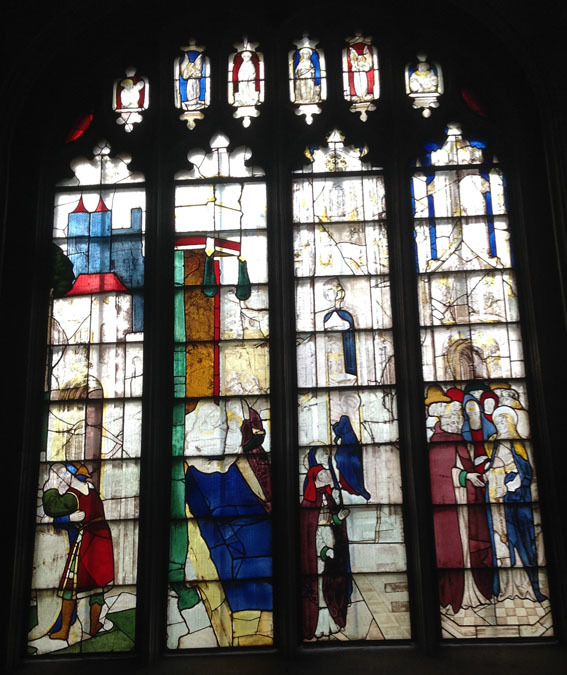 The big draw here is the magnificent set of 28 late mediaeval stained-glass windows. In fact it is the only complete set left in the whole country. 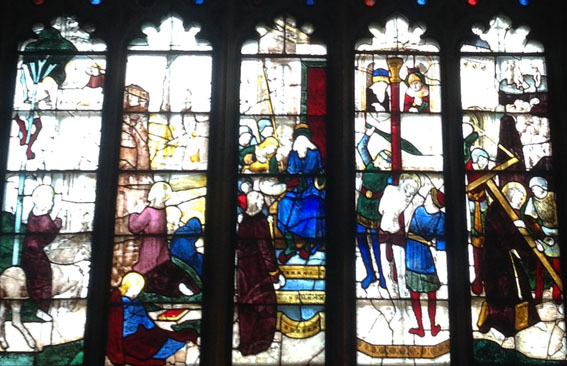 Exactly how Fairford managed to hang on to all of its beautiful glass during religious upheavals remains a mystery. We highly recommend the free audio guide, narrated by several famous actors including Richard Wilson, Joanna Lumley, Alan Rickman and Celia Imrie. 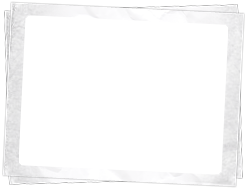 It is quite long, so do leave plenty of time to enjoy the tales it tells. 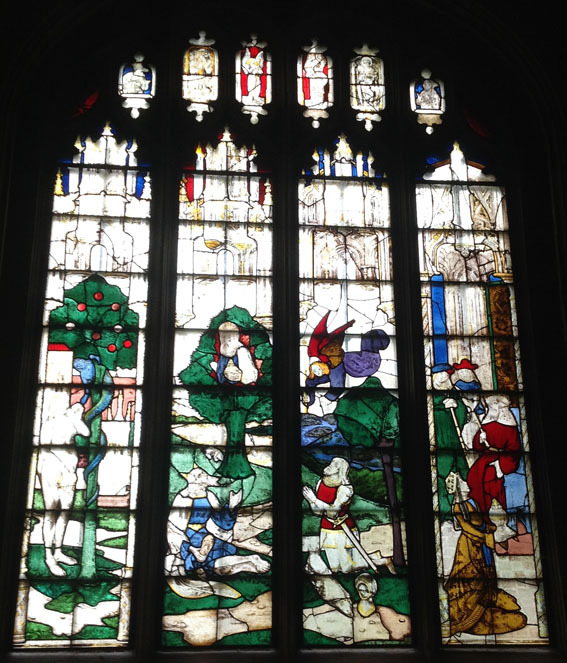 The windows tell their story in a particular order, starting at Window one by the North Door with the Temptation of Eve in the first glass strip (or 'light' as they are called). Note that the blue serpent in the tree also has a woman's face. In the other lights we see Moses (with his traditional horns) and the burning bush, followed by Gideon and the fleece, and finally the Queen of Sheba bringing gifts to Solomon. 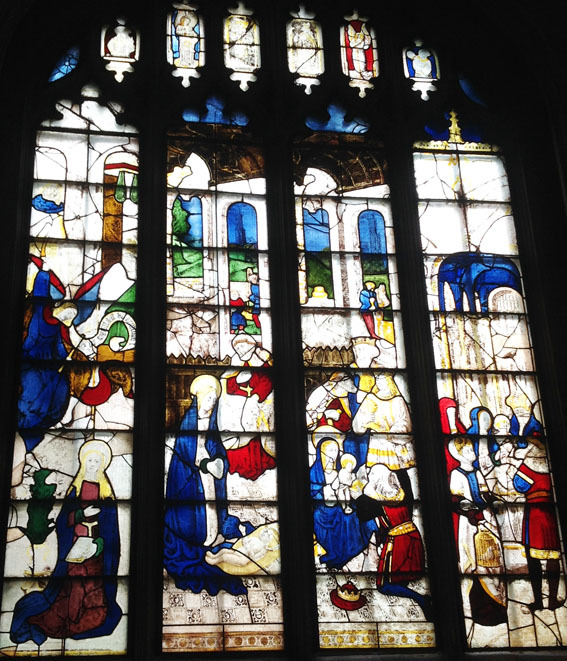 Window two deals with the birth and early life of the Virgin, starting with the betrothal of her parents Joachim and Anna, and ending with Mary's presentation at the Temple. Window three shows the birth of Christ. As the windows progress in time, we'll see how Mary's hair changes from golden long loose tresses to gradually more and more covered up. 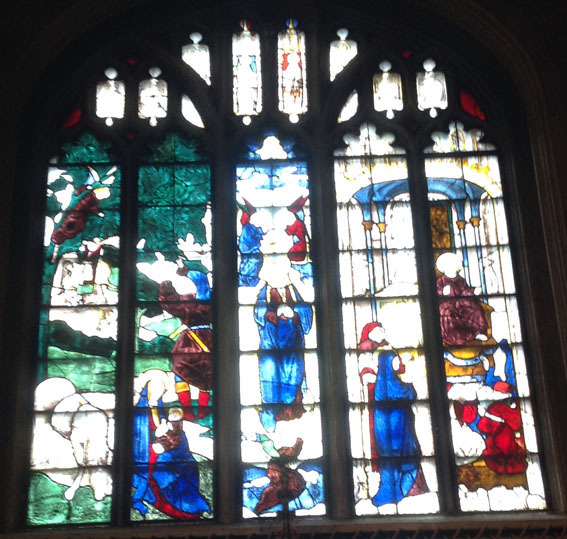 Window four's first light shows a green lush landscape as the infant Jesus and family escape King Herod. Up in the tree is a little angel, obligingly pushing down the tree bough for Joseph to pick fruit. 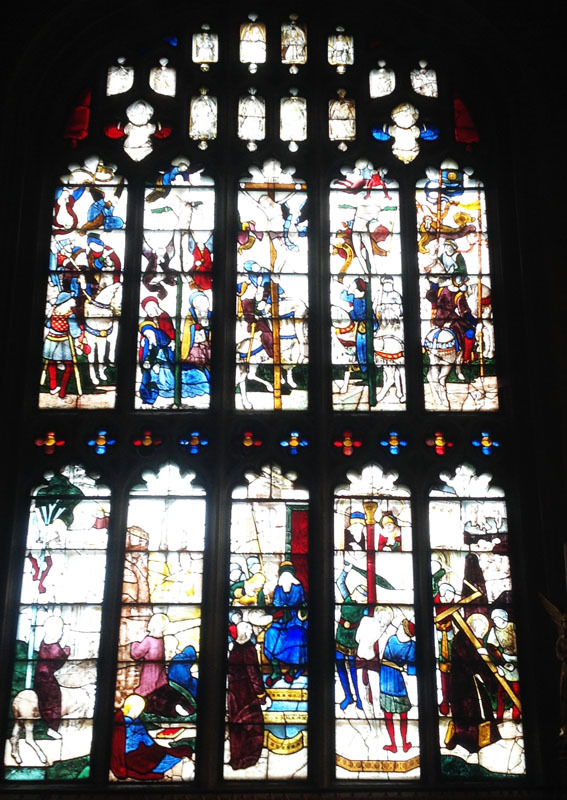 Now you will come to the magnificent east window in the chancel, containing 10 extremely finely detailed lights showing the events leading up to the crucifixion on the lower layer, and the event itself in the upper layer. The lower level lights take the story from Christ’s entry into Jerusalem in the first light to Christ carrying his cross in the last. Note the detail of the tortuous spiked square blocks attached to him to bang his legs as he walks. The upper level lights start with a curious depiction of a Tudor courtier, Sir John Savile. 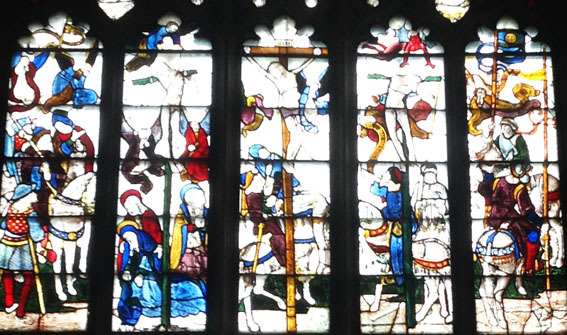 It is not at all clear why he has been included in this crucifixion window, and the audio guide gives him his own track if you want to learn more about him. The rest of the upper row shows Jesus on the cross flanked by the two thieves. The repentant thief on Jesus's right (our left) has a blue angel above his head, the unrepentant thief on the other side has a red devil above, waiting to 'take his soul'.